 A sturdy, secure top case for longer journeys or quick errands around town. 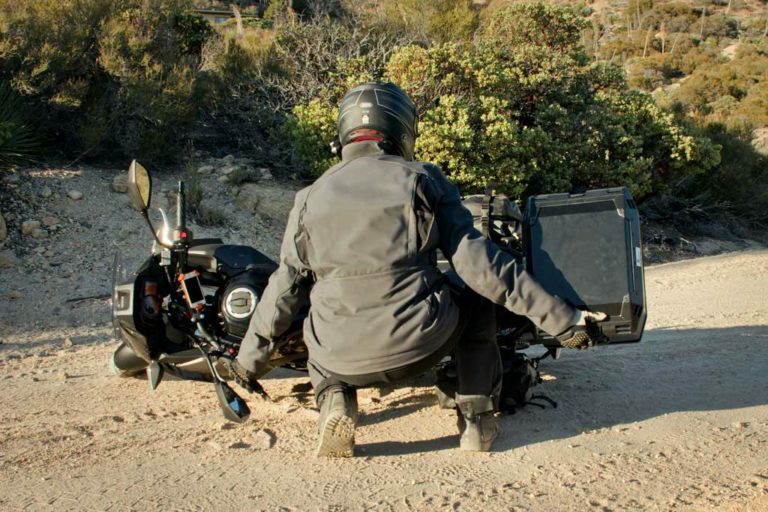 When it comes to adventure motorcycle luggage, top cases don’t get much attention. Yet they are one of the most convenient and useful luggage accessories you can buy. For starters everything is opened up wide, near eye level, making it easy to find items you need quickly. They are also lockable, so you can safely store a helmet, electronics or other valuables when you leave your bike unattended. And if you combine soft panniers with a top case, you get lockable luggage without the safety concerns many riders have about riding off-road with hard panniers. Hepco & Becker is one of the top brands in hard luggage, known for their strong German engineering and construction. A few years ago, the company overhauled their Xplorer top case to make them even more durable and secure. The latest generation are made of 1.5mm anodized aluminium with impact-absorbing moulded plastic along the edges. They feature a lid with a large opening and eight lash points on top for strapping down extra gear. The lid can also be completely detached for use as a tray. 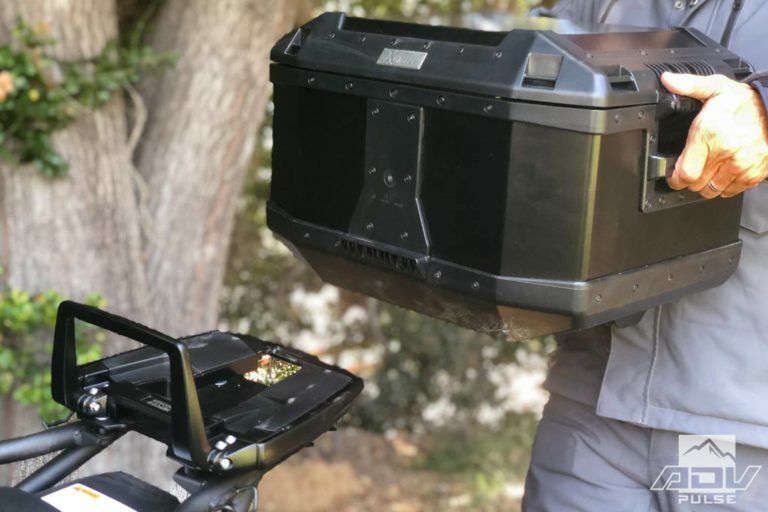 A quick-release mount system and integrated handles make it easy to carry the top box to a hotel room or campsite as well. 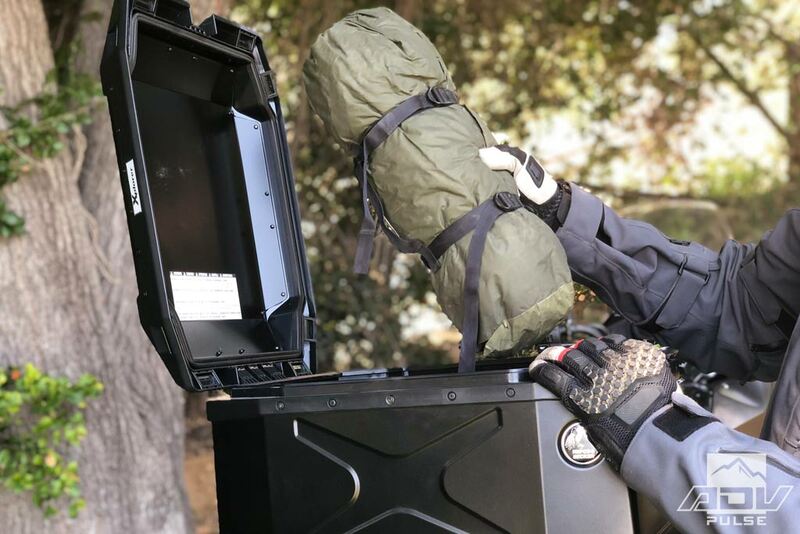 The Xplorer top case comes in either black or silver with a 45-liter capacity. We chose this case for the extra carrying capacity and because it can swallow a full-face helmet. 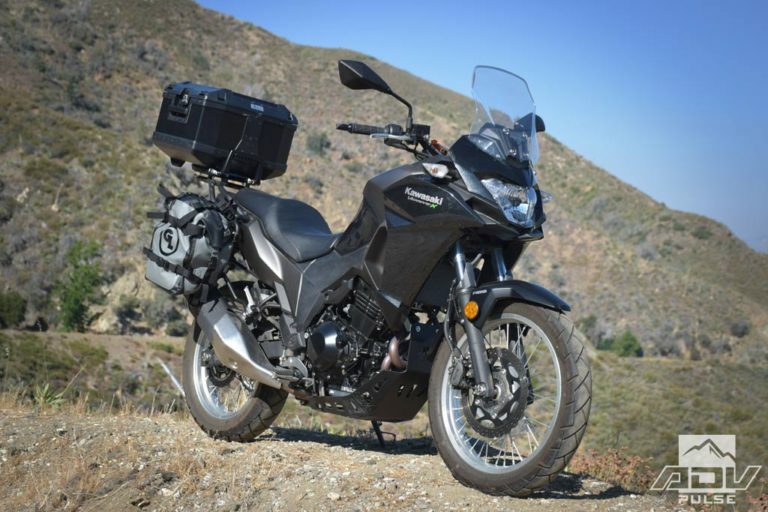 With our Kawasaki Versys-X 300 doing double duty as a round town errand getter, it was the perfect accessory for urban jaunts, not to mention its usefulness for our longer adventures. The Xplorer top case has a sturdy build and looks like a mini safe, but it’s fairly light at 10.35 pounds. Locks are all high-quality and it has a tight rubber seal to keep the elements out. Angular sides and plastic guards ensure that it maintains good structural rigidity in a fall while also giving it a rugged look that doesn’t look out of place on the trail. We mounted the top case using Hepco & Becker’s Easyrack system. The Easyrack has a support bow that holds the top box in place but also folds down flat, out of the way, when not in use. The Easyrack went on in about 10 minutes using just 8 bolts. There is also room for adjustment in the mounting position, allowing you to position the box forward or backward a few inches as desired. Once the rack was installed, the Xplorer top case slides on easily and snaps in place with precision. The Easyrack’s support bow folds down out of the way and six different lash points allow you to strap down a duffel bag or other items. We’ve been using the Xplorer top case for several months now and it’s proven to be convenient for running around town picking up parts or food for the office. 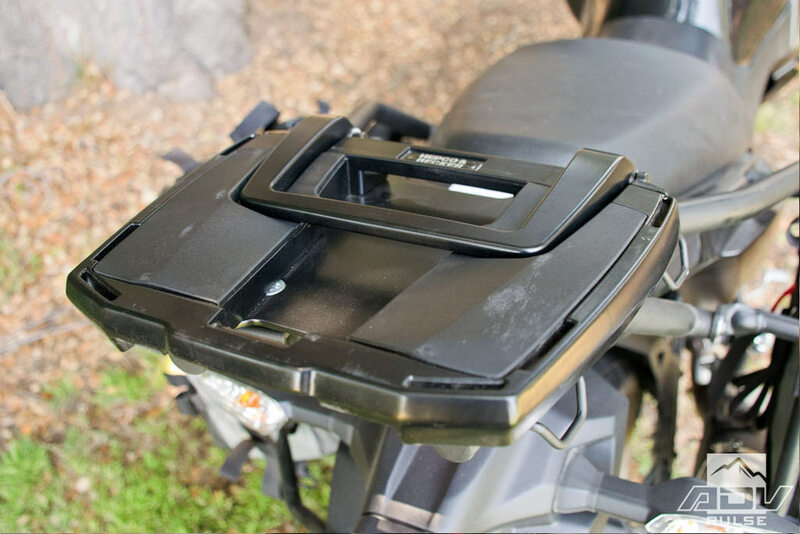 The top loading box opens from the right side of the bike so that when the bike is on its kickstand, the lid won’t fall closed. While the box doesn’t look huge, it does fit a lot of gear inside with a 45-liter capacity. With a width of 18.5 inches, it will hold longer items like a tent, tripod or camp chair. You can also place longer items diagonally (about 22 inches) if you need additional room. 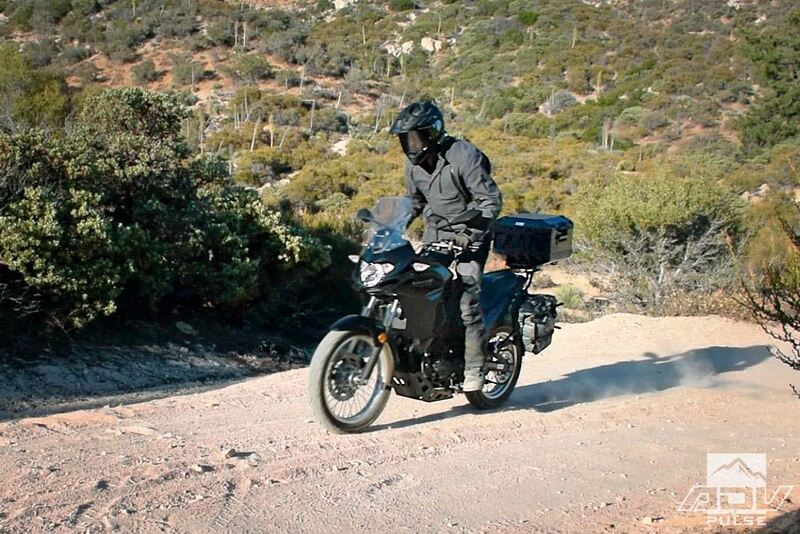 When riding off-road, it’s important to pack heavier items lower on the bike for the best handling characteristics. An overloaded top box can make your bike feel heavier to turn and more tippy in slower technical terrain. We rode with the Alu-case Xplorer top case filled with lighter items (e.g. clothing, sleeping bag, camp food, etc.) and put heavier items in the side bags. This ensured that the additional weight of a top box (compared to duffel bag) was less noticeable. The wide design of the Xplorer top case had us wondering if it might potentially expose the sides of the box to trail damage. But after our first tip over on the trail, we learned the side bags take the brunt of the punishment and there is still plenty of clearance between the top case and the ground. The grab handles also proved useful for picking up the bike after a fall. The grab handles on the top case proved useful for picking up the bike after a fall. Stops during the ride to shed a layer of clothing or switch gloves were made much easier with the convenient top-loading top case. 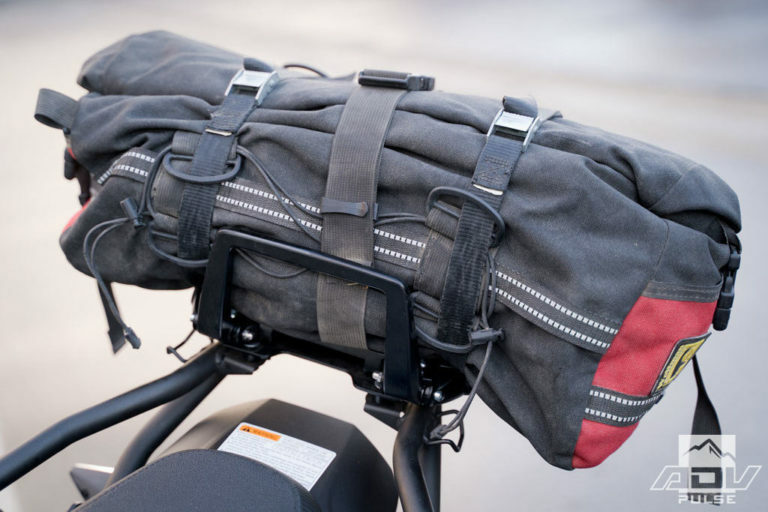 The top opens up wide for easy access to your gear, and you can quickly find what you are looking for without the hassle of loosening and re-tightening straps. We did notice if you try to push the lid open past 90°, it puts pressure on the plastic hinge and could potentially cause damage. If you want the lid out of the way, you can remove it easy enough. Just open it up to its maximum 90°, then give the lid a good yank to detach it completely from the hinge. The latch on the lid allows you to close it without locking it and it snaps down securely so you don’t have to worry about it opening up while you are riding. On one occasion though, we had been riding for about an hour on a rough fire road before we noticed we forgot to close the latch. Even though it was unlatched, the lid never popped open and thankfully no items were lost. Back on pavement, you never notice the box is back there. And at those sketchy gas stations or diners where you can’t watch your bike, a lockable hard box is a much better deterrent for the common thief. Weather was never a concern either with a water-tight rubber seal around the perimeter of the lid. For those times when you are riding without a top case, the Easyrack support bow folds down flat out of the way. With the support bow left up, it offers additional stability for a strapped-on duffel bag. There are also six different strapping points which allow you to use the Easyrack like a traditional top rack. Although, the slots to route straps are rather tight and some heavy-duty straps may not fit through the holes. The Easyrack support bow in the ‘up’ position offers additional stability for a duffel. 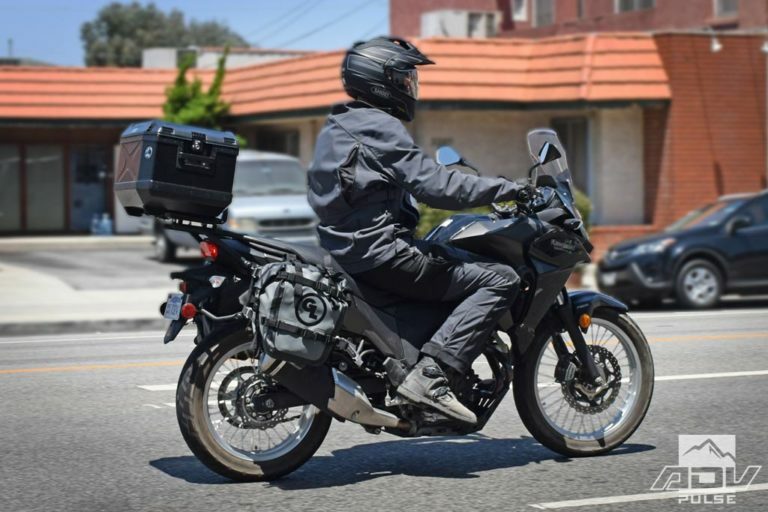 Adventure riders looking for a sturdy top case for longer journeys and those who want convenient lockable storage for around town. In addition, Two-up riders may find the extra storage capacity useful, and it makes a nice backrest for a passenger with the optional back pad attachment. It’s nice to travel with a safe place to store valuables on your bike. 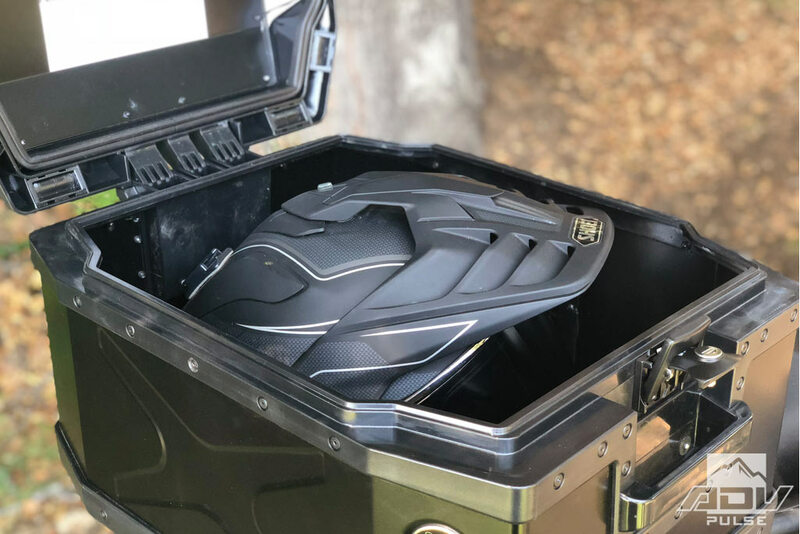 A top case offers more security than a helmet lock, keeping your expensive helmet out of sight, out of mind and out of the rain. 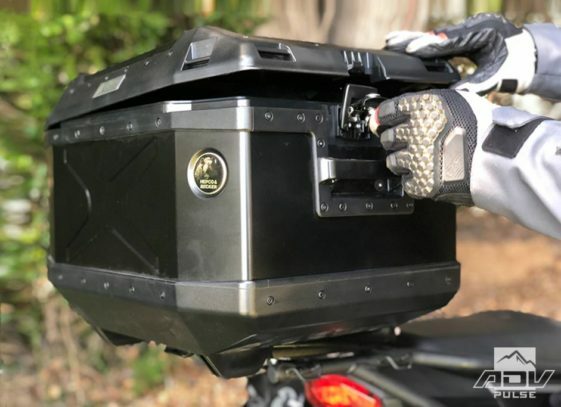 If you are simply looking for a secure storage solution, at just under $600 for the box and rack you can potentially save money over a set of hard panniers. 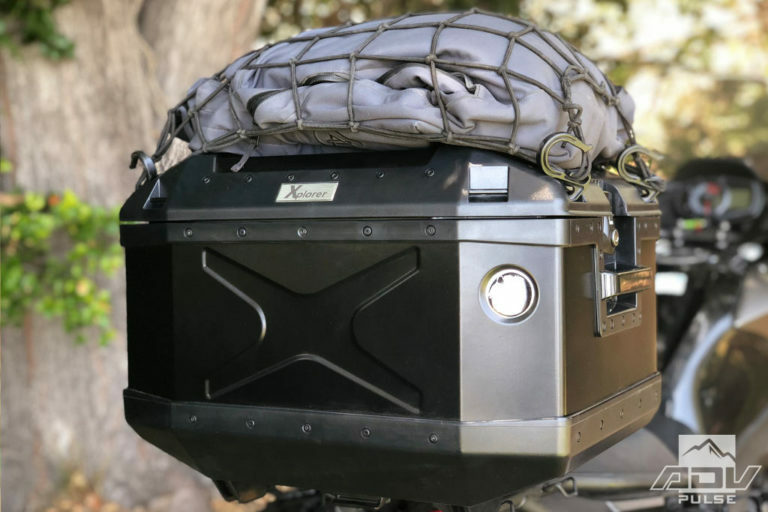 The 45-liter box has a good amount of space to carry your gear and its wide shape allows you to fit longer items inside. We really liked having fast access to our gear when pressed for time as well. The 45-liter box may be a little big for tougher trails but it works well for most off-road adventures, as long as you pack right. You can always leave the box at home for those rougher rides. The Xplorer top case held up well during our off-road testing. The latches, locks and mounting hardware all maintained smooth operation even after getting covered in dirt and grime. Lockable, waterproof storage for your valuables. Swallows a full-face helmet with room to spare. Quick, convenient access to your gear. Larger lash points on lid and rack to fit thicker straps or hooks. Design the lid to open up 180° for greater access.